The A8D is an exclusive 2-lounge layout with refined features, maximum therapy options and a distinctive style. This layout is so popular it has been one of the top-sellers for nearly a decade. 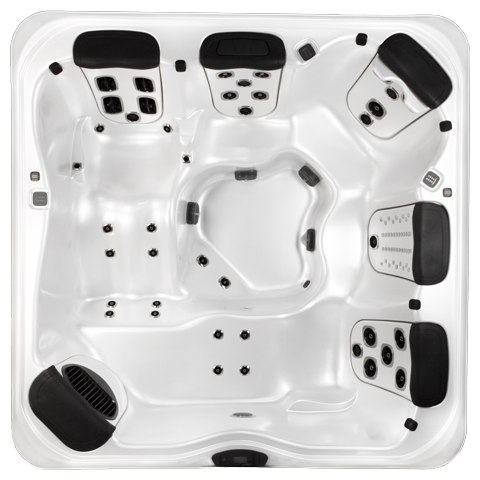 This is a spacious and relaxing 5-6 person hot tub with 5 unique JetPaks. The premium bent knee lounger can be outfitted with your favorite JetPak, and includes wrist, hip, calf, and foot jets to create a total relaxation experience. The unique dual lounge seats and assortment of massage types make this spa the ultimate therapy experience.